"Don't do anything I wouldn't do. That gives you a lot of leeway." In 1957, New York City's gossip columnists hold all the power. Each paper has their own man, touted in the advertising and legendary about town. Their words have the power to create a star or ruin a life. Chief among these men is J.J. Hunseeker (Lancaster), who meets with (and threatens) politicians, actors and anyone who would desire something from a man with his influence. Digging up stories and gossip for J.J. is press agent Sidney Falco (Curtis). Falco is anything but influential - he is near desperate. He takes to running lowly errands for J.J. to earn his favor and perhaps some column space for his pitiful list of clients; J.J. toys with him, keeps him around only as a reassurance of his power and importance. Sweet Smell of Success is the story of these two men. When J.J. decides he doesn't want his sister dating Derek, a musician, he asks Sidney to "take [him] apart". Sidney will be rewarded, of course, but perhaps the friendship of J.J. Hunseeker isn't something one should seek out. Though it was made years after the film noir explosion in the late 1930s and '40s, SSOS is unmistakably in that genre. All the hallmarks are there - the oppressive cityscape, teeming with corruption; the ambiguous anti-hero; and an overall bleak outlook on human nature. Of course, in some circles, noir is also a codeword for "incomprehensible" - witness the labyrinthine plots of films like The Big Sleep. Noir films are generally more about tone, character and setting. This one does a good job balancing these elements. The storyline is lean, efficient, and full of some excellent, tension-filled scenes; at the same time, it always carries the onerous mood of noir. The dialogue is excellent. It has a cadence, like poetry, and it is unnatural, yet perfectly fitting in the surroundings. The characters speak eloquently and at a rapid-fire pace, and their almost theatrical performances suit the musicality of the script. Thematically, SSOS is compelling even today. The basic ethical questions are still surprisingly relevant. Sidney is a moral black hole, willing to do anything if it helps his career, and his career is all about ruining lives anyway. Today, critics lambaste the press for sensationalism and a lack of ethical journalism. It seems the problem was apparent even in the '50s. The script is merciless in its attack on both J.J. and Sidney, clear on the notion of the corruption of both those with power and those who seek it. Of course, the film is probably best remembered not for its themes but for the two remarkable performances from the leads, since ultimately, it is a story about two men, one the dominating beast, a predator; the other a miserable creature, following after and hoping to pick up the scraps. Curtis and Lancaster were both considered studio stars at the time, yet both manage memorable, complex, and layered performances. The scenes where the two interact are the film's best - Sindey wants to be J.J., even though he often hates the man, and their conversations are marked by a simmering tension. The direction takes a back seat to the actors and the script, but that isn't to say it is lacking. Director Mackendrick goes for the subtle rather than the flashy - his careful compositions and metered pacing let the story unfold effortlessly; his New York is appropriately dehumanizing and cold. Perhaps it isn't well known as The Maltese Falcon or Double Indemnity, but it certainly has drawn critical accolades. Still as pessimistic and cutting as the day it was made, SSOS is a story work tracking down. Image Transfer Review: SSOS is nearly 45 years old, and its age shows a bit on this transfer, but it still looks acceptable overall. For the most part, the black & white image is well-rendered, with a very crisp look, with excellent shadow contrast. However, the print quality varies quite a bit, with some scenes looking very, very grainy, and others showing none at all. The print used for the master was in only fair shape - it shows some rather obvious lines throughout. Still, for the age of the picture, this is a good transfer, even if it isn't up to par with some of the Criterion restoration jobs. Audio Transfer Review: This mono mix presents the dialogue very well - it is always audible and natural (except for one obvious instance of ADR near the end of the film). The score is mixed well with the speech and effects, but like many older tracks, it sounds a bit harsh—with such a brassy, noisy score, things get a bit shrill once in a while. On the plus side, there is no audible hiss from the center channel. Extras Review: Another in MGM's $14.95 budget line, SSOS contains no extras save the trailer, which runs three minutes and features an amusing voice-over. MGM once again disappoints by leaving off English subtitles. 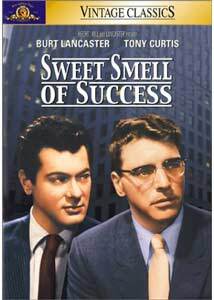 Sweet Smell of Success is worth seeing for the lead performances alone. Lancaster and Curtis are legends, and they both have big, meaty roles to work with here. It also doesn't hurt that the script is meticulously crafted, suspenseful, and thrilling. Classic noir.